SINCE THE CONSTRUCTION OF THE FIRST EMBEDDED SYSTEM IN THE 1960S, EMBEDDED SYSTEMS HAVE CONTINUED TO SPREAD. THEY PROVIDE A CONTINUALLY INCREASING NUMBER OF SERVICES AND ARE PART OF OUR DAILY LIFE. THE DEVELOPMENT OF THESE SYSTEMS IS A DIFFICULT PROBLEM WHICH DOES NOT YET HAVE A GLOBAL SOLUTION. ANOTHER DIFFICULTY IS THAT SYSTEMS ARE PLUNGED INTO THE REAL WORLD, WHICH IS NOT DISCRETE (AS IS GENERALLY UNDERSTOOD IN COMPUTING), BUT HAS A RICHNESS OF BEHAVIORS WHICH SOMETIMES HINDERS THE FORMULATION OF SIMPLIFYING ASSUMPTIONS DUE TO THEIR GENERALLY AUTONOMOUS NATURE AND THEY MUST FACE POSSIBLY UNFORESEEN SITUATIONS (INCIDENTS, FOR EXAMPLE), OR EVEN SITUATIONS THAT LIE OUTSIDE THE INITIAL DESIGN ASSUMPTIONS. EMBEDDED SYSTEMS PRESENTS THE STATE OF THE ART OF THE DEVELOPMENT OF EMBEDDED SYSTEMS AND, IN PARTICULAR, CONCENTRATES ON THE MODELING AND ANALYSIS OF THESE SYSTEMS BY LOOKING AT MODEL–DRIVEN ENGINEERING , (MDE2): SYSML, UML/MARTE AND AADL. A CASE STUDY (BASED ON A PACEMAKER) IS PRESENTED WHICH ENABLES THE READER TO OBSERVE HOW THE DIFFERENT ASPECTS OF A SYSTEM ARE ADDRESSED USING THE DIFFERENT APPROACHES. ALL THREE SYSTEMS ARE IMPORTANT IN THAT THEY PROVIDE THE READER WITH A GLOBAL VIEW OF THEIR POSSIBILITIES AND DEMONSTRATE THE CONTRIBUTIONS OF EACH APPROACH IN THE DIFFERENT STAGES OF THE SOFTWARE LIFECYCLE. CHAPTERS DEDICATED TO ANALYZING THE SPECIFICATION AND CODE GENERATION ARE ALSO PRESENTED. CONTENTS FOREWORD, BRIAN R. LARSON. FOREWORD, DOMINIQUE POTIER. INTRODUCTION, FABRICE KORDON, J&EACUTE;R&OCIRC;ME HUGUES, AGUSTI CANALS AND ALAIN DOHET. PART 1. GENERAL CONCEPTS 1. ELEMENTS FOR THE DESIGN OF EMBEDDED COMPUTER SYSTEMS, FABRICE KORDON, J&EACUTE;R&OCIRC;ME HUGUES, AGUSTI CANALS AND ALAIN DOHET. 2. CASE STUDY: PACEMAKER, FABRICE KORDON, J&EACUTE;R&OCIRC;ME HUGUES, AGUSTI CANALS AND ALAIN DOHET. PART 2. SYSML 3. PRESENTATION OF SYSML CONCEPTS, JEAN–MICHEL BRUEL AND PASCAL ROQUES. Since the construction of the first embedded system in the 1960s, embedded systems have continued to spread. They provide a continually increasing number of services and are part of our daily life. The development of these systems is a difficult problem which does not yet have a global solution. Another difficulty is that systems are plunged into the real world, which is not discrete (as is generally understood in computing), but has a richness of behaviors which sometimes hinders the formulation of simplifying assumptions due to their generally autonomous nature and they must face possibly unforeseen situations (incidents, for example), or even situations that lie outside the initial design assumptions. Embedded Systems presents the state of the art of the development of embedded systems and, in particular, concentrates on the modeling and analysis of these systems by looking at model-driven engineering , (MDE2): SysML, UML/MARTE and AADL. A case study (based on a pacemaker) is presented which enables the reader to observe how the different aspects of a system are addressed using the different approaches. All three systems are important in that they provide the reader with a global view of their possibilities and demonstrate the contributions of each approach in the different stages of the software lifecycle. Chapters dedicated to analyzing the specification and code generation are also presented. Contents Foreword, Brian R. Larson. Foreword, Dominique Potier. Introduction, Fabrice Kordon, Jerome Hugues, Agusti Canals and Alain Dohet. Part 1. General Concepts 1. 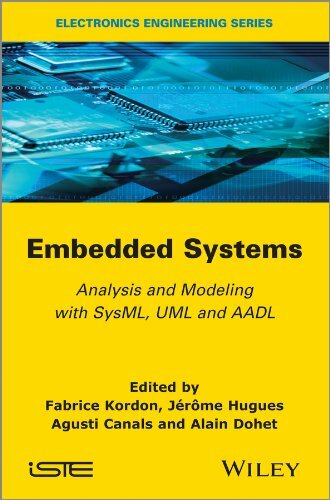 Elements for the Design of Embedded Computer Systems, Fabrice Kordon, Jerome Hugues, Agusti Canals and Alain Dohet. 2. Case Study: Pacemaker, Fabrice Kordon, Jerome Hugues, Agusti Canals and Alain Dohet. Part 2. SysML 3. Presentation of SysML Concepts, Jean-Michel Bruel and Pascal Roques. 4. Modeling of the Case Study Using SysML, Loic Fejoz, Philippe Leblanc and Agusti Canals. 5. Requirements Analysis, Ludovic Apvrille and Pierre De Saqui-Sannes. Part 3. MARTE 6. An Introduction to MARTE Concepts, Sebastien Gerard and Francois Terrier. 7. Case Study Modeling Using MARTE, Jerome Delatour and Joel Champeau. 8. Model-Based Analysis, Frederic Boniol, Philippe Dhaussy, Luka Le Roux and Jean-Charles Roger. 9. Model-Based Deployment and Code Generation, Chokri Mraidha, Ansgar Radermacher and Sebastien Gerard. Part 4. AADL 10. Presentation of the AADL Concepts, Jerome Hugues and Xavier Renault. 11. Case Study Modeling Using AADL, Etienne Borde. 12. Model-Based Analysis, Thomas Robert and Jerome Hugues. 13. Model-Based Code Generation, Laurent Pautet and Bechir Zalila. About the Authors Fabrice Kordon is Professor at University Pierre and Marie Curie in Paris, France, where he is in charge of the team Modelisation et verification of the LIP6. His research field is at the crossroads of distributed systems, software engineering and formal methods. Jerome Hugues is lecturer-researcher at the Institut Superieur de l Aeronautique et de l Espace (ISAE) in Toulouse, France and has been a member of the language standardization committee (AADL) since 2006. His research fields cover the engineering of embedded systems and the generation of automatic code of these systems from modeling languages, integrating verification and analysis tools on the model and code level. Agusti Canals is a software engineer and has worked at CS Communication et Systemes in Paris, France since 1981. He is deputy director of the Direction de la Qualite et des Audits Techniques (DQAT) of CS and an expert in software engineering (certified UML Professional and SysML Builder by OMG). Alain Dohet is a general armament engineer at the Direction Generale pour l Armement (organization of the French Defense Minister ensuring the conduct of system programs), where he is in charge of guiding activities, skills, methods and tools in the fields of systems of systems (SoS), systems engineering, analysis for certification purposes, operational safety of embedded computing systems and critical software. Fabrice Kordon is Professor at University Pierre and Marie Curie in Paris, France, where he is in charge of the team "Mod lisation et v rification" of the LIP6. His research field is at the crossroads of distributed systems, software engineering and formal methods. J r me Hugues is lecturer-researcher at the Institut Sup rieur de l'A ronautique et de l'Espace (ISAE) in Toulouse, France and has been a member of the language standardization committee (AADL) since 2006. His research fields cover the engineering of embedded systems and the generation of automatic code of these systems from modeling languages, integrating verification and analysis tools on the model and code level. Agusti Canals is a software engineer and has worked at CS "Communication et Syst mes" in Paris, France since 1981. He is deputy director of the "Direction de la Qualit et des Audits Techniques" (DQAT) of CS and an expert in software engineering (certified "UML Professional" and "SysML Builder" by OMG). Alain Dohet is a general armament engineer at the "Direction G n rale pour l'Armement" (organization of the French Defense Minister ensuring the conduct of system programs), where he is in charge of guiding activities, skills, methods and tools in the fields of systems of systems (SoS), systems engineering, analysis for certification purposes, operational safety of embedded computing systems and critical software.